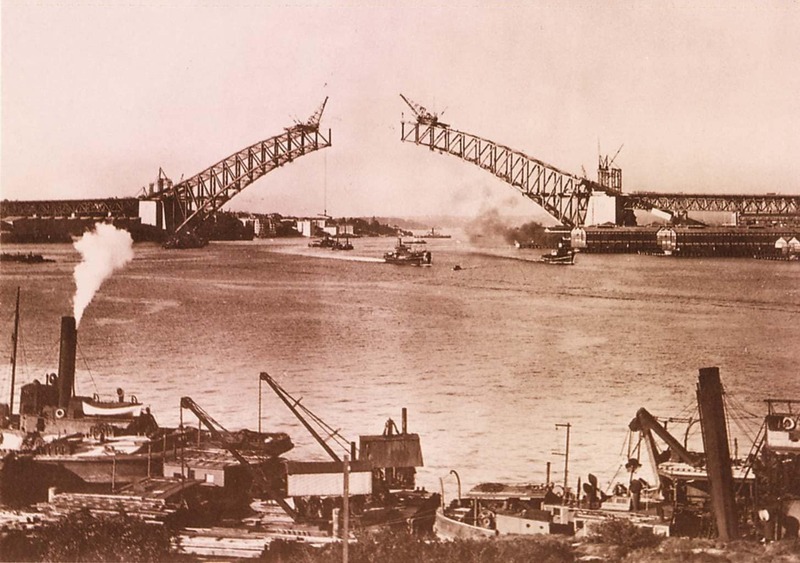 History holds that only 16 people died during the long construction of the Harbor Bridge, despite the lack of safety measures and the fact that most of them stood and worked on the bridge freely. As I set out to climb this grand human feat I wonder, would anyone survive jumping off the bridge? I am perfectly fitted out. We wear mechanic-style suits from feet to neck and are not allowed to bring anything other than our shoes and sunglasses for which there are suitable attachments to keep them from falling off. Anything that would be lost could fall on a passing car and cause havoc. We don’t look pretty. The clothes are ill fitting and rather unflattering. The rest of the gear is attached to the belt, that is the jumper which becomes handy up there in the cutting wind, and a variety of artifacts mostly attached to our derriers which I can’t figure out what they are for. The belt is also our security harness, hooked to the railings placed all along the climb. I wonder what would happen if we did slip or trip, would this hook truly keep us from falling off? Entering the catwalk of this gigantic structure is like descending into the guts of a pre-historical beast. The steel trembles every few minutes as a new train crosses above fetching city dwellers to and from the business district. The bridge has 8 car lanes, split into six main lanes and two side ones where the tram used to circulate. As you walk through and up the ladders you can feel the sturdiness and strength of the structure, which has been holding up for almost a century. After a few sets of stairs we eventually emerge in the middle of the oncoming traffic as if peering from the underground. As our guide Scott acutely points out, the bridge was constructed starting from both ends and the engineers, without computers or equipment as advanced as today’s, managed to somehow calculate the measurements almost to the centimeter and only missed by 8 when the two sides met in the middle. It’s fantastic! 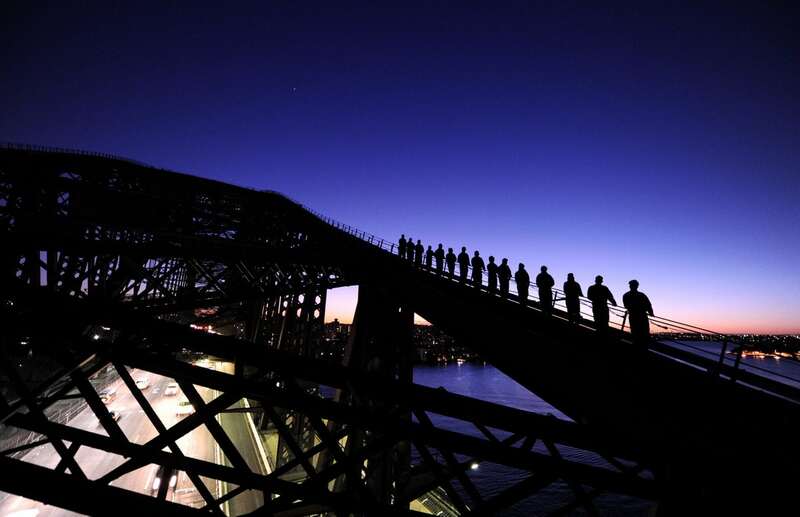 The Founder of the Bridge Climb, Paul, dreamed of taking people up the bridge since he inherited his grand father’s railway ticket, the first one ever sold on the bridge. 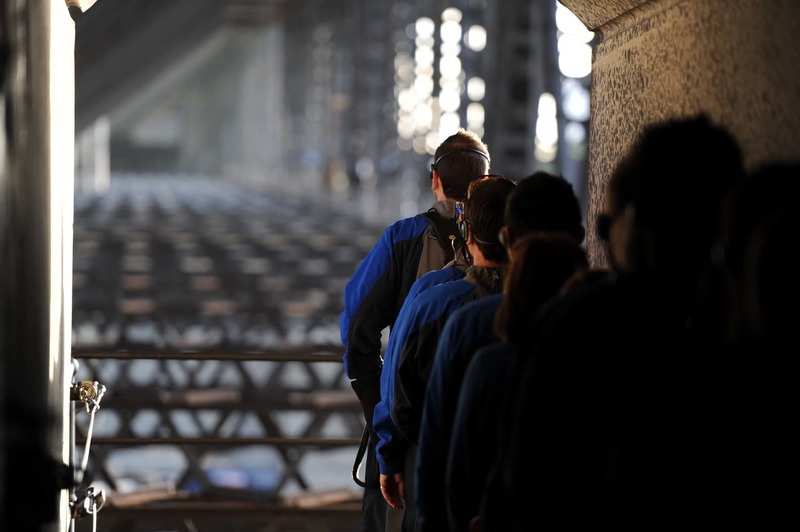 After a one-off trip op the bridge, he set off to make his dream come true and 8 years later, The Bridge Climb opened its doors. Over 3 million people have completed the climb, 600,000 of which did it through gift cards. Many a couple get engaged up there above the Opera House with sweeping views of the city and you can even get married. Climbs run every 10-15 minutes all day and night long. During our climb, I see plenty of other guests at various levels of the structure in front, below and behind us. It is indeed a very popular activity and the views explain why. We ascend slowly, stopping to take in the views every few meters. It is chilly and windy. Climbers go up even if the wind peaks up to 80 km/h. Today it is only 25 km/h and yet I can’t imagine what it would be like if the wind was 4 times stronger. Would we be blown away? 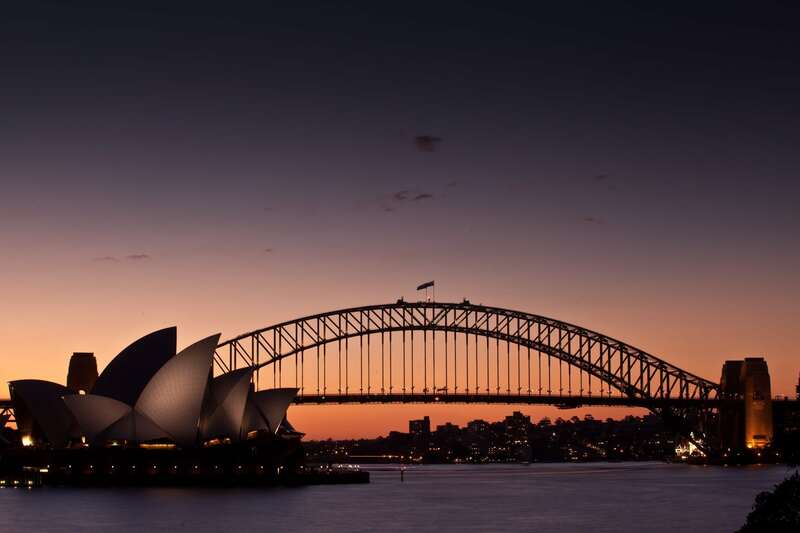 With every step, I look back down to the city, the Opera House in its full splendor appears as a small bright seashell, Circular Quay seems empty from such a height, tourists are only distant tiny dots. We hear all the stories about the bridge. Scott explains in much detail everything there is to know, from how the bridge was built to plenty of anecdotes and jokes to keep you smiling. I wonder how many times he has been up here, does it still feel special to him? We got on the regular climb which takes just over 3h to complete not because of true physical exercise but because of how long it takes to get fitted out and the generous amount of time the you are allowed to simply stare all around you, 360 degrees above the Harbour. I can hear Scott’s voice through the headset and it sounds like a lullaby as I take a deep breathe and absorb the views. As we are heading down Scott starts to list all the people who died on the bridge like a walking memorial. As a bit of a science geek I find it interesting when he specifically clarifies that jumping off the bridge and falling on the water would be like plunging onto hard cement. The water, at such speeds, would feel like a brick wall. We carry on through the staircases and back in the guts of the bridge when he then pronounces. “Well guys, this is the time when you are expected to jump off the bridge. Are you ready?” I look at him, then stare back down onto the cement water. He is not kidding, he truly expects us to jump off. I was not told this is how it all ends and, after having been thinking about it the entire climb it now feels like it may actually be possible. I look back at him again and his face is trying to hide a grin. It then dawns on me. The bridge officially ends as we reach the main building so, essentially, as we jump from the bridge onto the tunnel we came from at the start of the climb we actually do jump off the bridge and land on cement. Only it is the cement floor of the main Bridge Climb building, a step away. 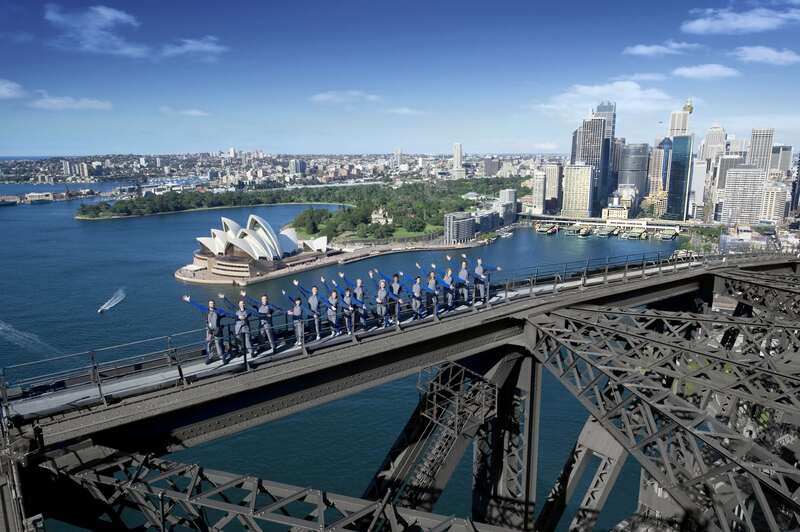 I gather a bit of speed and do as I’m told, jumping off the Harbour Bridge. 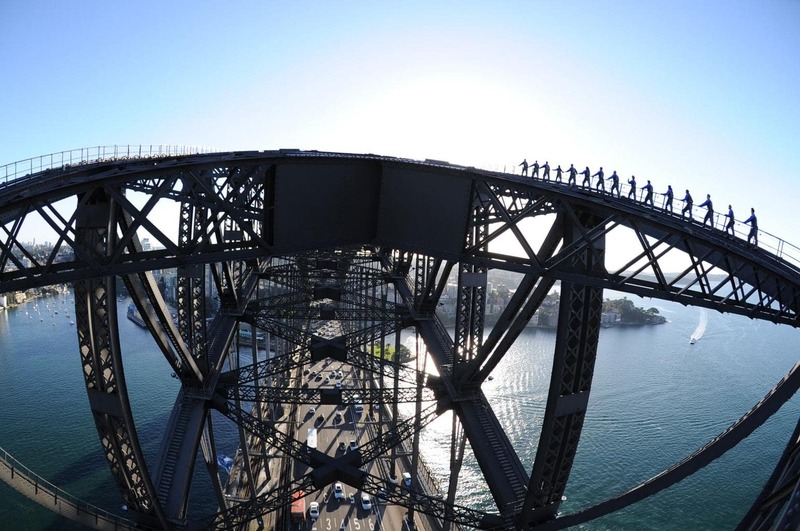 All photos have been provided by the Bridge Climb team as, for security reasons, you are discouraged from bringing your own equipment. This Climb was done courtesy of the Bridge Climb. All opinions are honest and my own.